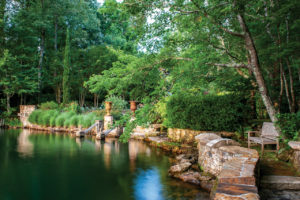 When a tornado leveled much of his property on the shores of Lake Martin, Jim Scott created a classically-inspired, whimsical space that continues to evolve and captivate. Some twenty-odd years ago, a tornado made its way through Dadeville, Alabama, taking down almost every tree on Jim Scott’s property on the south side of Lake Martin. 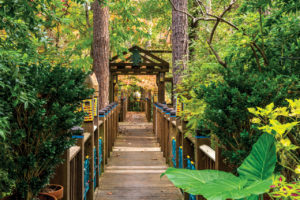 Undeterred, Jim distilled beauty from destruction by creating a fantastical garden around what remained—his Bobby McAlpine-designed home and a whole lot of red clay. 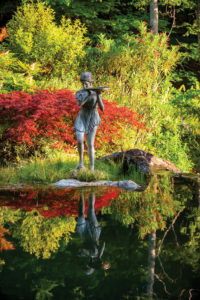 A tour with the gardener is as enlightening as the land itself. 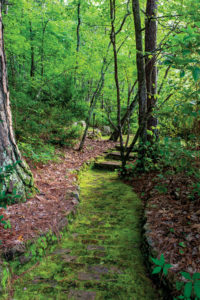 Jim and I set off on the first path that presents itself from the large elevated porch. 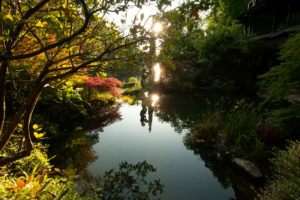 Once the immediate awe at the wonder before me subsided (and I closed my mouth after my jaw literally dropped), I settled into the pace that this garden commands. Immediately I wanted to ask Jim why he built this masterpiece, or what his inspiration was, and who he built it for, but I quickly realized that the answers to these questions and more can only be drawn out over a nice afternoon stroll with this charming 82-year-old gentleman. 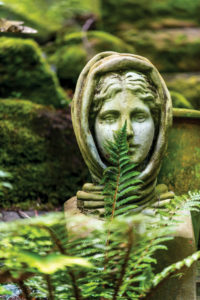 Concrete statues and herms gathered from his travels populate certain focal points. Any metal furniture he’s added, encouraging visitors to sit and relax, are all painted in his favorite color, Gypsy Teal. At last count, there were more than 16 tables dotting the garden, which means that Jim can host quite the soiree. 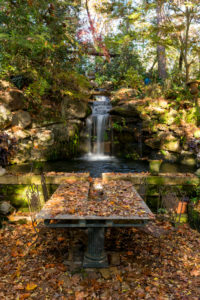 One stone table is hidden just so and has been thoughtfully built with a water feature beside it “so guests can easily wash their hands before dining,” he says. With a heart for reclamation, Jim has repurposed the best building materials throughout the property. Much of the sandstone came from Sewanee (his alma mater). 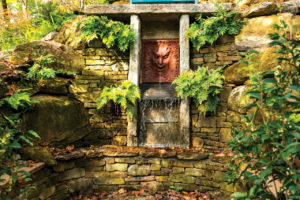 Cut stones that did not pass muster for building have now found a forever home. 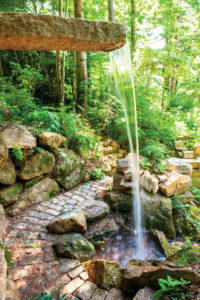 Granite was repurposed from the streets of downtown Montgomery, and the city’s old curb stones have been transformed into benches, walls, and conduits for waterfalls. Iron railings came from unwanted or excess production at the Robinson Iron foundry in nearby Alexander City. And the wooden larger-than-life chess pieces were turned from a fallen tree at Jim’s church, Grace Episcopal in Mt. Meigs, Alabama. Great design also gets repurposed in each new structure on the property. 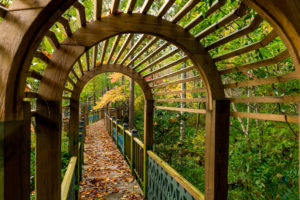 Beautiful wooden carvings from his home are repeated in the skywalks and woodland canopy outbuildings. 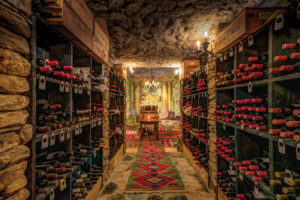 And then there is the wine cellar. 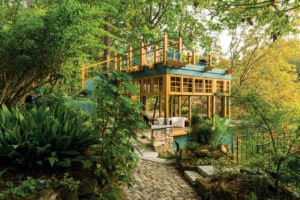 Across a set of well-placed stepping stones and behind a repurposed mahogany door, I step inside to hear the same classical music that gently filters through the trees outside. It fills the cool air of this cave, nested into the side of a hill. Jim jokes that the cellar holds what may be “the finest collection of high-end vinegar.” Muted classical paintings line the walls, and if you look closely enough, you can find Jim’s face on one of the cherubs. That in and of itself is worth the trip. 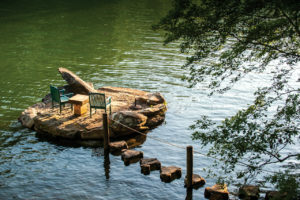 All joking aside, and given that he has a lifetime invested in this Lake Martin jewel, it is only natural to want to know what the future might be for this retreat. Jim directs my attention to a series of folders with plans he hopes to implement. He has dozens upon dozens of pages of legal paper filled with doodles and drawings, architectural renderings, and notes about things he wants to do. And knowing his level of intentional curiosity, we can’t wait to see what’s next. Always the entertainer, Jim believes his garden is meant to be shared. 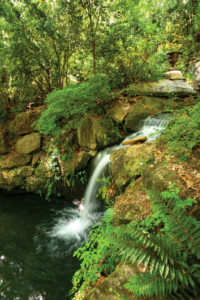 He hosts a variety of parties in the tranquil setting. One of his favorites? Something he likes to call a table party. 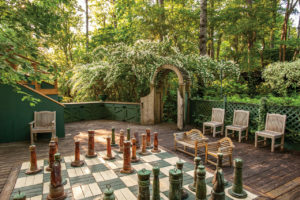 “There are about 16 tables throughout the garden. I’ll invite friends from all over—some from my work with the Alabama Shakespeare Festival, somebody from my law firm, maybe a ditch digger—and let them know how many guests they can each bring. I start the night with a cocktail party and then draw each guest’s name from a hat to tell them which table they are assigned. They bring in their own food, cutlery, and plates. In the past, some guests brought chefs from Birmingham while others dined on Kentucky Fried Chicken. It is great fun,” Jim says.